Mr. Charles Johnson was the vice president of development of the Lilly Endowment in Indianapolis. In relation to Michigan’s philanthropic history, he served as a volunteer member of the board of trustees of the Michigan Community Foundations’ Youth Project, helping to shape the early policy, approve grants, and review progress. He also was involved in creating and funding the Giving Indiana Funds for Tomorrow (GIFT) initiative that had similar goals to MCFYP. Vice president of development at Lilly Endowment Inc.
Mr. Charles Johnson talks about his career in philanthropy. Mr. Charles Johnson talks about the history of The Lilly Endowment and its relationship with Michigan foundations. Mr. Charles Johnson talks about the growth of academic centers on philanthropy. Mr. Charles Johnson talks about the remarkable leadership of Russ Mawby and Dottie Johnson. Mr. Charles Johnson talks about the relationship between the states of Michigan and Indiana. Mr. Charles Johnson attended Earlham College, a Quaker college on the east side of Indiana, during which time he participated in a work-study program. Mr. Johnson was assigned to drive the college’s president to various speaking engagements throughout the state, thereby indirectly gaining exposure to the world of college trustees and public relations. These experiences became a driving force behind his desire to work for a non-secular educational institution, and about a year after graduation from Earlham College, Mr. Johnson entered Hartford Seminary to obtain a theological degree. Mr. Johnson worked as the vice president of development for Earlham College from 1970 until 1973, when he took the position of director of development with Henry Ford Hospital in Detroit, Michigan. In 1976, Mr. Johnson was offered the position of vice president of development at Lilly Endowment in Indianapolis, Indiana, where he would work until his retirement in 1994. The Lilly Endowment is a large private grantmaking foundation that focuses its giving in the state of Indiana. These values were instilled in Mr. Johnson as a young boy and reinforced throughout the duration of his career and into retirement. After a few years of working at the Lilly Endowment, Mr. Johnson began to ask the question, “How might some of the endowment resources be used to strengthen the independent sector?” He found that many nonprofits were under-budgeted and understaffed and therefore did not have the necessary resources to adequately train and develop their staff in fundraising, grant writing, and philanthropy. Mr. Johnson learned about Mr. Henry Rosso’s The Fund Raising School®, which provided seminars throughout the country. After attending one of these seminars and speaking with those in attendance, Mr. Johnson began a relationship with Mr. Rosso. Mr. Johnson knew that Mr. Rosso had a product that could be of great value to the independent sector, and Mr. Rosso needed additional resources. The Lilly Endowment extended a grant to Mr. Rosso for his program, The Fund Raising School®, so he could expand the number of people working with him. Over time, Mr. Johnson, Mr. Rosso, and Dr. Eugene Tempel, a development officer for the Indianapolis branch of Indiana University, discussed the idea of Indiana University adopting this program. The initial funding would come through the Lilly Endowment, with Indiana University increasingly taking responsibility for the program. Through collaboration of chief development officers and a faculty committee at Indiana University, the financial support of Lilly Endowment and the W.K. Kellogg Foundation, Mr. Johnson, Mr. Rosso, Dr. Tempel, and others helped to create the Center on Philanthropy at Indiana University, and brought The Fund Raising School® under the center’s umbrella (1). Throughout his career, Mr. Johnson fostered collaborative efforts and symbiotic relationships with Michigan philanthropy leaders such as Russell Mawby and Dorothy A. Johnson, as well as with the W.K. Kellogg Foundation. Mr. Johnson recalled that, “Michigan and Indiana, without any formal relationships, sort of continued that effort and we were supportive of each other.” Mr. Johnson served on the advisory committee for the Michigan Community Foundations’ Youth Project reviewing community foundation grant requests including organizational and fundraising development plans. He returned to Indiana with this idea and helped launch the Lilly Endowment-funded Indiana GIFT initiative. This multi-million dollar, multi-year effort helped to create community foundation services for every citizen in the state of Indiana. Mr. Johnson has been recognized and honored for his major contributions to the field of philanthropy throughout his career. In addition to being a founding member of the Indiana University, Center on Philanthropy, he was a founding member of the National Committee of Planned Giving (now called the Partnership for Philanthropic Planning) and organized the Indiana chapter of the National Society of Fund Raising Executives (now Association of Fundraising Professionals). Mr. Johnson is responsible for initiating a program to provide ongoing training for Indiana private college presidents, board members, and fundraising personnel through the Independent Colleges of Indiana Foundation. 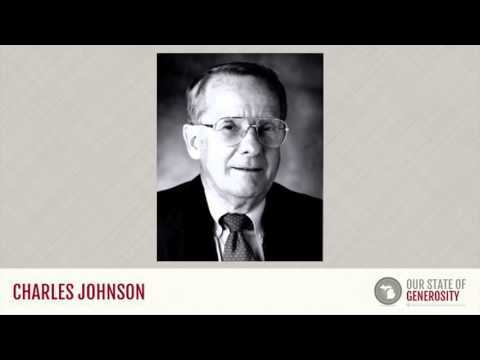 In 1995, Mr. Johnson received the Henry A. Rosso Medal for Lifetime Achievement in Ethical Fundraising, and in 1998, he was awarded with an honorary Doctor of Humane Letters degree from Indiana University. For many years, Mr. Johnson continued to serve on the board for the Center on Philanthropy at Indiana University but stepped down from this service to create room and opportunities for new pioneers in the field. Mr. Johnson also served as a board member for the community foundation for the southern Arizona community in which he resided before his death in March, 2016. We remember Charles Johnson for outstanding leadership in promoting philanthropy. He was a friend, a trusted colleague, and will be greatly missed. His work in philanthropy will live on as a tribute to his values and life. We are honored to have known and worked with him. Mr. Johnson was interviewed regarding his insights and experiences in working with Michigan’s philanthropic community and the Our State of Generosity (OSoG) partners. The following are selected quotations from his interview specifically related to the five organizing themes of the OSoG project.